Known as one of the most popular tree nuts around, pecans come from a large deciduous tree native to North America and Mexico. The nut can be found in hundreds of different varieties, and can be enjoyed fresh, roasted, or added in various recipes . Best of all, the health benefits of pecans can be experienced all year round. Composed predominantly of fat – with a fat content of 70+ percent – pecans contain more fat than just about any other nut. But don’t let fat content fool you; these large, buttery flavored nuts are rich in numerous vitamins and minerals known for promoting various aspects of health. 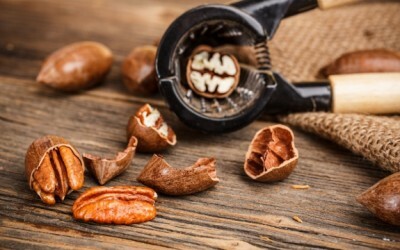 Below I have outlined some of the most prominent nutrients found in pecans. The figures are based on a 1 ounce serving (28 grams) of pecans. Fiber – 2.7 grams. 11% RDA. Manganese – 1.3 milligrams. 64% RDA. Copper – 0.3 milligrams. 17% RDA. Thiamin – 0.2 milligrams. 12% RDA. Magnesium – 34.2 milligrams. 9% RDA. Phosphorus – 78.2 milligrams. 8% RDA. Iron – 0.7 milligrams. 4% RDA. Protein – 2.6 grams. 5% RDA. Fatty Acids, Total Polyunsaturated – 6.128 grams. According to NutritionData.Self, pecans contain 279 milligrams of omega-3 fatty acids and 5828 milligrams of omega-6 fatty acids (per 1 ounce). Check out the USDA Nutrient Database for a complete nutritional profile of pecans. 2. Boosting Heart Health – Fiber is also known to boost heart health. Pecans also contain heart-healthy monounsaturated fats like oleic acid along with phenolic antioxidants. Both of these substances help to prevent coronary artery disease and strokes. Additionally, one study (of many studies coming to similar conclusions) published in the August 2006 issue of Nutrition Research found that pecans may help prevent coronary heart disease by inhibiting unwanted oxidation of blood lipids. Don’t forget to tell your friends and family about all of the health benefits of pecans! Very valuable and important information produced that can help many. Why was a recipe "FLAGGED"????????????????? WHAT happened with Mike? He is not here – newsletter- anymore? the have change the form and now look zoo messy. We all get more than our fair share of omega 6's in our diet without having to supplement, yet we need to take supplements to increase our intake of omega 3's. Is this a good move for anyone suffering with any kind of inflammation in their body? From the Magnesium, read the full article.